Joseph Stiglitz, during the question and answer session after his talk at the World Summit on Technological Unemployment in New York on February 29, 2015, was asked whether he supported an Unconditional Basic Income as a policy response to technological unemployment. He replied, “Yes, that’s part of the solution. He quickly went on to say that Basic Income is not all. He talked about other financial reforms, “predistribution” – changing the rules of the market economy, eliminating the peculiar system in which land speculators are taxed at a lower rate than other people, and so on. In other words, Stiglitz endorses it, but does not emphasize it. This is somewhat of an unusual position; most people seem to have strong feelings about it whether for or against. 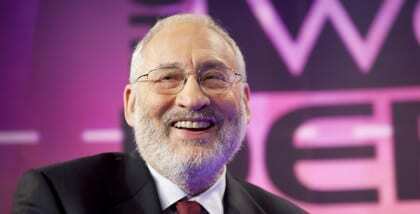 Stiglitz is for it, but he sees it as a small part of a host of financial and other reforms. Stiglitz joins a long list of Nobel-prize winning economists who have endorsed some form of Basic Income Guarantee, including James Tobin, Milton Friedman, James Buchanan, James Meade, Paul Krugman, F. A. Hayek, Herbert A. Simon, and Robert Solow. More on the World Summit on Technological Unemployment can be found online at: http://www.wtn.net/technological-unemployment-summit. Having advocated some form of Universal Basic Income, and equally or perhaps more importantly, how best to pay for it, for well over forty years, I wish to add a few comments to this conversation regarding the necessary contribution to the betterment of all life on our potentially pleasant Spaceship Earth. Socioeconomic Democracy is offered as a peaceful, effective and democratic resolution to humanity’s past, present and needless systemic problems. The crucial question is whether humanity has yet evolved sufficiently to understand and peacefully eliminate the utterly unnecessary obstacles to further healthy development and evolution. Socioeconomic Democracy (SeD) is a theoretically consistent and peacefully implementable psycho-politico-socio-economic system wherein there exist both some form and amount of locally appropriate Universally Guaranteed Personal Income (UGI) and some form and amount of locally appropriate Maximum Allowable Personal Wealth (MAW), with both the lower bound on guarantee personal income and the upper bound on personal material wealth set and adjusted periodically and democratically by all participants of a democratic society. Socioeconomic Democracy is easily implemented with elementary Public Choice Theory. The median values of society’s preference distributions regarding these two crucial societal parameters peacefully, democratically and unambiguously resolve the matter. An alternative to Socioeconomic Democracy as defined above would be where the two economic boundaries were considered and established by, say, the legislative branch of a “Representative” Democracy. In an increasingly automated workforce, basic income seems like it might be the only way forward. To create an inclusive space, and mitigate some of the unnecessary pooling of wealth at the top. The United Kingdom has a century-old history of providing ‘universal benefits’ to its citizens. It began with David Lloyd George’s introduction of the Old Age Pension in the early 20th century. In recent years we have had the introduction of Winter Fuel Allowance. A universal flat rate payment per person over pensionable age in a household. In similar vein, all British citizens over the age of 60 are entitled to free travel on municipal bus services. If we can have these very easy to administer payments/benefits (everyone gets them!) then why not a Basic Income for All? The problem is that the British government is busy trying to dismantle these universal payments. Child Benefits are now subject to means-testing. The winter fuel payment and ‘pensioner’s bus pass’ could shortly go the same way. Consequences of this are two-fold – administrative costs go up and receipt of benefit becomes a stigmatic mark. Benefits provided to all regardless of wealth and status generate ‘social glue’, a sense of common endeavour – we all chip in and we all take out. Some of us chip in a lot, some a lot less but we all take out the same from the state. I think its called Social Democracy – more power to it! I just noticed the bottom image and its caption. That’s funny, Karl. Actually, that’s just one of their conference photos. I just used their name as the caption for their photo. It wasn’t consciously a joke on my part, but I get it. It’s like what was that Trump meeting on sexual assault, and it was all men. Something like that.